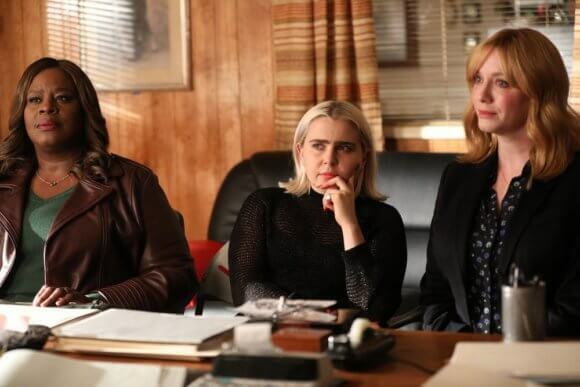 There’s good news for fans of NBC’s Good Girls. The network has given the popular drama starring Christina Hendricks (Mad Men, Another Period), Retta (Parks and Recreation), and Mae Whitman (Parenthood, Arrested Development) order for a third season. Season two debuted on March 3, 2019 and has been averaging 4.1 million viewers. NBC reports each new episode of season two has actually increased its seven-day non-linear viewership numbers. In addition to Retta, Hendricks, and Whitman, the season two cast includes Reno Wilson (Mike & Molly), Manny Montana (Graceland), Lidya Jewett (Hidden Figures), Isaiah Stannard (Brad’s Status) and Matthew Lillard (Twin Peaks). Good Girls is written and executive produced by Jenna Bans. Jeannine Renshaw, Mark Wilding, Bill Krebs, and Michael Weaver executive produce. Weaver also directs. “Season two of Good Girls is all about our women dealing with the consequences of their criminal behavior. When we last saw Beth, she had just returned home triumphant — her plan to have Rio and the gang arrested, a success, or so she thought — only to find Rio in her dining room, with a gun trained on her bloodied and beaten husband, Dean. As the season came to a close, a shaken Beth was left holding Rio’s gun as he taunted her to pull the trigger and shoot him: the only way out if she and Dean wanted to walk away alive. What happens in the wake of the trigger being pulled will have life changing consequences that ripple through the entire season for Beth, Ruby and Annie.